Amore made a scene during the company's November pay per view. Former WWE Superstar Enzo Amore has said he made a disruptive scene at the company's Survivor Series 2018 pay per view to gain Vince McMahon's respect. 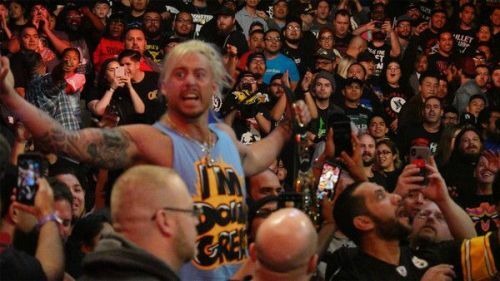 Enzo Amore debuted as part of WWE's NXT brand, working alongside Big Cass in NXT and on RAW, before going it solo, capturing the Cruiserweight Championship at No Mercy 2017. In January 2018, Amore was fired by the company, for failing to notify them of a sexual assault case against him, that was later dropped due to insufficient evidence. Amore claims that did not know about the case until WWE asked him about it. At Survivor Series 2018, Amore appeared in the crowd, before being confronted by security, and was ejected from the Staples Center and subsequently banned from the arena. Speaking at the West Side Comedy Club in New York City, Amore disputed claims he had disrupted the show to draw attention to his rap career. "It had nothing to do with my music. I’ll tell you why I did it -- I knew for a fact, Vince McMahon would be heated more than anything in the world -- but he’d respect the f**k out of it. The former 205 Live Superstar also spoke about Lisa, the security guard who confronted him, who reportedly received a standing ovation afterwards by the WWE locker room. Despite the Survivor Series incident, Amore has claimed there isn't enough money for him to enter a ring again, and is now focussing on his rap career.